A number of years ago, I had the opportunity to go sailing with a good friend of mine. One beautiful Spring day when we both had some time and he called and asked me to go sailing with him. I was thrilled to join him. I had sailed before and looked forward to the experience once again. We met at the lake and got on the boat to get underway. Slowly we motored out of the inlet into the lake and then put up the sails. It was a great experience! I loved the sounds of the wind in the sails, the waves on the boat and the experience of sailing by wind power alone. If you are familiar with Lake Erie, it’s a large lake and a great place to sail. The problem with sailing on Lake Erie is that for such a large lake is relatively shallow. On the western basin of the lake, it averages only around 25-30 ft deep. Being so shallow, if there is any real wind, it can cause the waves to swell and it can make a trip on the lake a rough one. But not this day. We had a great time and a wonderful day on the lake. Suddenly, and really without warning, a storm came up. It was a big one. 50-60 mile per hour winds and gusts, 5-6 foot waves, black clouds moving overhead. Quickly the lake cleared of other boats. Within minutes we alone and we were in the middle of the storm. Our boat was leaning with the storm winds at 50 degrees or more. The waves were washing over the deck. The skies were black. The rain was intense. But then I turned around and looked at my friend as he steered the boat across the lake. HE WAS SMILING! I couldn’t believe it. Didn’t he see what I saw? Didn’t he know this was bad? I had looked at the captain’s face. He knew things about our boat that I didn’t. He knew we were fine. Within a few moments my fear turned to calm. Because I trusted the captain I began to enjoy the ride. 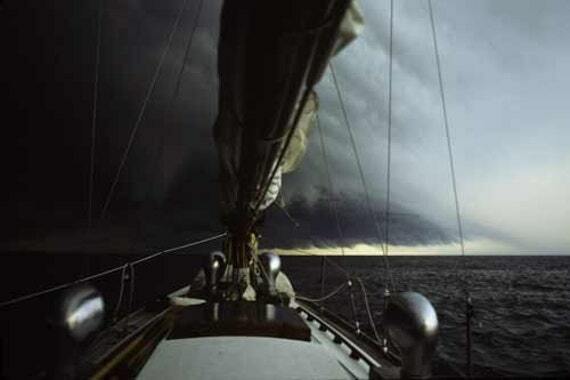 Nothing had changed… the wind still blew, the rains still came, the waves still washed over the deck, but something was different… I had seen the captain’s face. The Christian life is much like this little adventure of mine. We are often caught in the storms of life and fear for our lives, our finances, our health. This life is often overcome by a storm when we least expect it. I finally understood the fear they experienced. Panic is in our voices. But then, with fear growing, we look at Jesus and discover that He is there. He is there with a look of comfort on His face and with no fear. How can He be so calm in this storm? Doesn’t he know we are about to go down? I am convinced that as I go through this life, that sometimes God calms the storm… sometimes He doesn’t. Sometimes He lets the storm rage and calms His child. It’s funny how a glance at the face of our captain, Jesus, can change a fearful storm into an exciting adventure. A look to the captain’s face can make all the difference in the world. Before you think that posting my stat numbers is bragging… I promise you, it’s not. I am humbled by the fact that I have been able to keep it going this long. So many blogs have come and gone over the years since I started writing. During the 8-plus years of writing this blog, I’ve seen my reader numbers rise and fall. Sometimes dramatically. I have learned to not let statistics drive my writing. I am tenacious. Stubborn. Determined. If I think a post is good — I’ ll keep putting it out there until it gets its due. I’ve been watching “Footprint’s of a Legacy Left Behind” numbers climb. I’ve seen my statistics continue to remain steady. Just about the time I think it is over and it is time to quit, I get a wave of new people reading my site. I have always wondered what makes some sites “popular,” while others die off without so much a bang. Sometimes, it’s because the blogger loses interest, gets busy with work or whatever else. Other times, there’s a sense of mental exhaustion. Good ideas popping when the blog began fade and there’s nothing new. It isn’t easy to write day after day. It is one of the hardest things I have ever done in my life. It isn’t exactly automatic, these days I don’t always have the words to say. I always look for inspiration. I always look for a reason to write. Lately, most days… I can’t find a reason. I struggle to be creative. I struggle with keeping it fresh. I struggle with writing about things I have written about before. I find myself using titles that I used in the past. I always have to check my database to ensure that I don’t use one from the past. Before blogging, my best writing was done with pen and paper on long writing pads. Collectively those writings were by far my best. I was a blogger before there was such a thing. A young mind that was full of fresh ideas, stories and perspectives. They are now gone… buried, forever lost and inaccessible. When blogging arrived, I instantly realized I was late to the party. Like many things in my life, I came to the party and left before it started and by the time I made my way back the party was over. Over the years writing, “Footprint’s of a Legacy Left Behind”, I have learned that I like writing. I’ve always liked it, since the first time I posted my first article. People now read what I write. I am still not sure how I feel about that. I have been amazed — and still am — by all of you who have dropped by. I started this blog over 8 years ago, by myself, from nothing. I now have accumulated over a half million visitors! I know I’m small potatoes compared to many other sites. I know bloggers who have millions of hits and tens of thousands of followers. For me, this is fine. When it works… when I am inspired, it’s fun. I get to write whatever I want, when I want … or not. No one tells me what to say or in how many words in which to say it. Thank you for finding “Footprint’s of a Legacy Left Behind” interesting enough to visit every now and then, especially when there is so much else going on in the world. What are my chances of making it to a million? In the meantime, I’ll just keep writing. This day, the disciples grieved. They had thought Jesus was the Messiah… the Savior. Grief was more than they could bear. Fear hung in the air. But what about the miracles? What about this Jesus who told the wind to be still and it did? This is Saturday, the day after the crucifixion. But just wait a few hours. Because when the Son rises the world would never be the same. It’s as if the God who is beyond time would ever be late, but we wait. We wait for His answers, His provision and His arrival. It seems that all of the Christian life involves waiting on God, but it’s more than that… it’s about our focus, our dependence. Waiting on God keeps my focus, my dependence, my eyes on Him. Waiting on the one who always meets our needs. It feels that God is late, but how could He be? He knows my need, He knows me. I wait for the only one who can help me… the God of all creation. Waiting… it’s the hardest part.